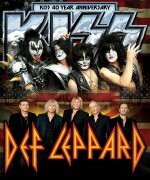 Def Leppard and KISS will start their Summer Tour 2014 of the USA and Canada on 23rd June and there are 1 day to go. They will play 42 shows starting on day 23rd June 2014 in West Valley City/Salt Lake City, UT. KISS will close each night with each band playing for 90 minutes. The shows currently run until 31st August 2014 in Houston/Woodlands, TX. As the date of the first show approaches there will be a spotlight of each city to be played. The 42nd and (currently) final show takes place in Houston. All of the previous live shows in this city are listed below starting in 1980 on the On Through The Night tour. The 31st August show will be the 15th by the band in this city.